The National Reconnaissance Office's NROL-15 payload, encapsulated in a 5-meter diameter fairing, is mated to a Delta 4 Heavy rocket in preparation for a planned June 29 launch from Florida's Cape Canaveral Air Force Station. 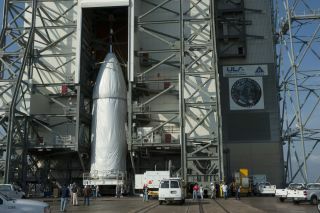 Concerns about Tropical Storm Debby have delayed the launch of an American spy satellite by 24 hours, pushing the planned liftoff to Friday (June 29). The United States National Reconnaissance Office's NROL-15 spy satellite is now slated to roar into space from Florida's Cape Canaveral Air Force Station at 6:13 a.m. EDT (1013 GMT) Friday, officials announced on Tuesday (June 26). Cape Canaveral is on the Atlantic coast of Florida, not far south of Debby's projected path across the state. The storm is already dumping huge amounts of rain on northern Florida, and the wet weather will likely continue for a little longer yet. "Debby is expected to produce additional rain accumulations of 4 to 8 inches over northern Florida and extreme southeastern Georgia during the next couple of days," the National Hurricane Center said in an advisory at 11 a.m. EDT (1500 GMT) Tuesday. "Isolated storm total amounts of 25 inches are possible in northern Florida." Debby's center remains just west of Florida's Gulf coast, and the slow-moving storm has been weakening as it heads toward landfall, which is expected to take place by early Wednesday. Debby's sustained wind speeds are currently topping out around 40 mph (64 kph), the advisory added, though forecasters caution that the storm could gain strength when it pops out into the Atlantic. NROL-15 will blast off atop a United Launch Alliance Delta 4 Heavy rocket. The satellite onboard is a classified "national security payload," according to a Tuesday ULA statement. The rocket team is taking some precautions to deal with the expected inclement weather. "The protective Mobile Service Tower will remain around the launch vehicle and is scheduled to be moved for launch Thursday evening," ULA officials said in the statement. The National Reconnaissance Office is one of more than a dozen U.S. intelligence agencies. It builds and operates the nation's spy satellites.